Fabricworm Giveaway: FQ Bundle of ENTIRE Maritime Collection by Charley Harper! Hello Fabricworms! As we say goodbye to February, we thought we'd giveaway one of the most anticipated collections to arrive this month: Charley Harper's new Maritime collection! We recently took this awesome collection to QuiltCon and it was met with great interest as we sold out of many of the bolts we had brought for the event. We'd like to extend the awesome vibes from the event to this week's giveaway. 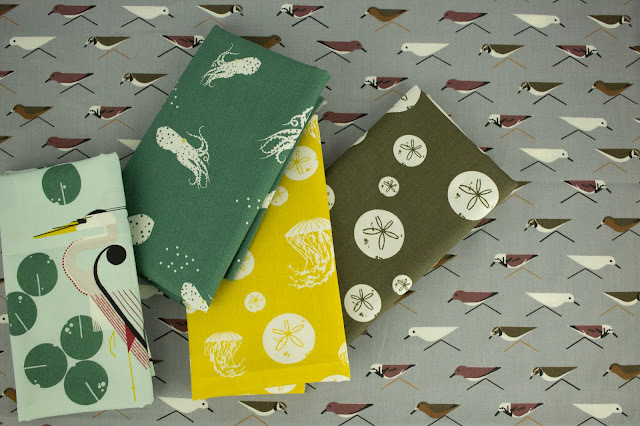 Enter to win a fat quarter bundle of the ENTIRE Maritime collection by Charley Harper for Birch Organic Fabrics! If you are feeling up to making a darling little Charley Harper quilt, then check out the new Sea Feed Quilt Kit by Lunden Designs and get started now! This giveaway ends on Sunday 3/2/16 @ 12 am PST. The winner will be contacted shortly after by email. The winner will be chosen randomly by Gleam. Make an awesome quilt with some of the row by row h20 patterns. 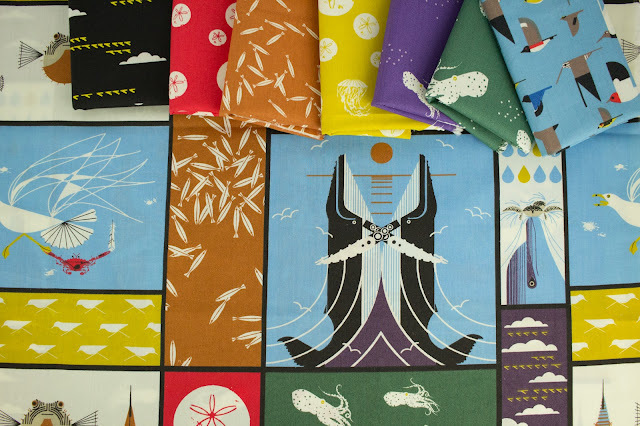 I love Charley Harper in general and using fabric made with his designs is so much fun! I would make some nice soft blankets and pillows. I love these, I'd definitely make a quilt out of them. I love the Charlie Harper prints! I'd make a quilt or two out of them. I think they would be perfect for my nephews! I would make my first fussy-cut quilt. I think it would look great on the sofa on my front porch this summer. Thanks for the great giveaway! I'm sorry, but I couldn't find the organic fleece on your website. At any rate, I LOVE maritime and thank you for the chance. Very interesting fabric! Hmm.. Dreaming about What to make is the most fun! What a gorgeous collection of fabrics. I would have such fun sewing up some delightful creations for some special littlies. I saw this in a secret in-progress project long ago and was intrigued. My youngest grandson would love this! I would like to make some pajamas. Thanks! I like fleece for scarves although I'm hoping it will soon be too warm to wear them! oh my, these are completely gorgeous, gorgeous. A snuggly couch quilt would be just the thing to make. I love Charley Harper! 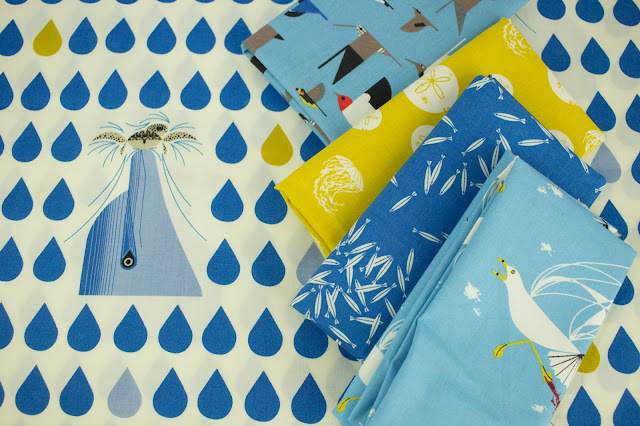 We already have a CH bird quilt and it would so love to have a maritime brother or sister! I'd make a baby blanket with pink fleece! I'd make a small quilt for the wall! Most likely I would make a small quilt, got a grandson on the way! These prints are perfect for kids clothing! Oh my goodness! 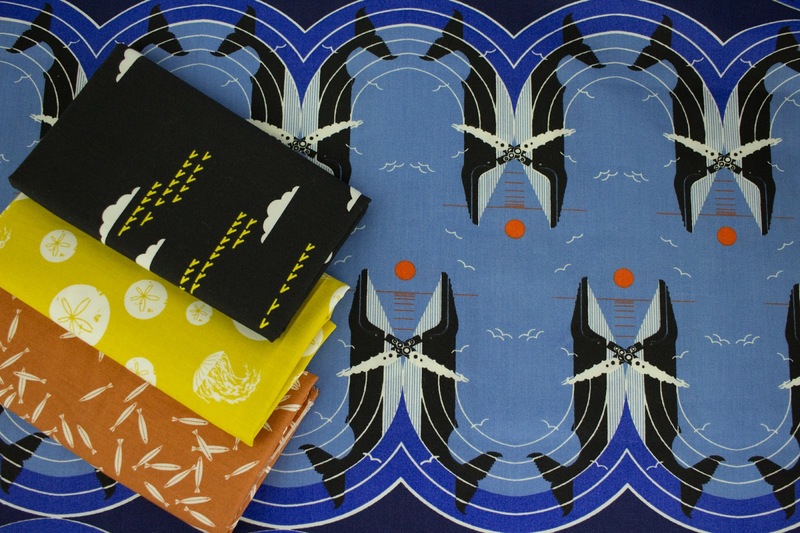 I love Charley Harper and the Maritime collection is perfect!! Now that spring is coming, I would choose orange as my fleece color, and I would use it to line some cute vests for my kiddos. I am a HUGE Charley Harper fan and have made so many cute things with his nature collection. Would love the opportunity to make more with his newest collection. Love these prints - sew perfect for summer! Gorgeous colours and prints. I would love to make some pillows with this fabric! Each ch line keeps getting better! Can't wait to get my paws on some of this! WHAT A NEAT GIVEAWAY>LOVE THIS COLLECTION! Love this collection! So many great projects to make from it. I would love to make a green fleece hoodie. I would make a cozy quilt with the teal. I love love love this collection! I'd make a quilt. Coming into Autumn here in Australia, some snuggly fleece would be lovely to make my two Whippets some new dog coats - stylish and warm! One in teal, one in orange! I love all of Charley Harper's art....to have his designs on fabric is a DREAM! The Airdrie bag by sew much ado. It's be great lining! I would make sleep pants in lime green organic fleece! Oh My! I can't even imagine winning the collection! How exciting! Thanks for the chance! I love Charley Harper. I saw some tiles in a gift shop in PGH that were as to die for as the fabric collections. Thanks! A jacket for my daughter. With my favorite color of organic fleece...lavender...I would make a comfy pair of lounging pants for me! I would make a lovely cozy throw quilt perfect for my nieces and nephew to cuddle under. I love a blue, any blue colored fleece. This is an amazing bundle-- would need to become cozy quilts for my kiddos... or a picnic quilt for outdoor summer lunches! Thank you! I'd probably make some pants for my kids! And I would say blue in color! This is amazing! My favorite of the Charley Harper collections so far! I would love to make a quilt with this fabric! I've been very into nautical things lately. I'm (finally) going to make my dad something... everyone else has something from me.. my kids, my mom, my husband, my friends... now it's my dad's turn... and I might even get it done by Father's Day! He loves sandpipers! I would make pj pants with fleece. I would make a cute poncho with 2 yards of fleece. And my favorite color of fleece is purple. I would use it as backs for quilts. My favorite color is Aqua. I love the topical fish! So cute! I would love to win this fabric. I see the quilt finished. I use fleece to back my quilts. This fabric line is gorgeous! I would make a fabulous charity quilt for the children's ward at my local hospital. I would use it to back a quilt. Hats and aqua. Great giveaway. Pjs! It will be getting cooler here in Australia! I'd make blankets in blue fleece! Gorgeous prints in this collection. I'd make a baby quilt for charity. I would make some cute pajamas! Thank you for the wonderful giveaway. 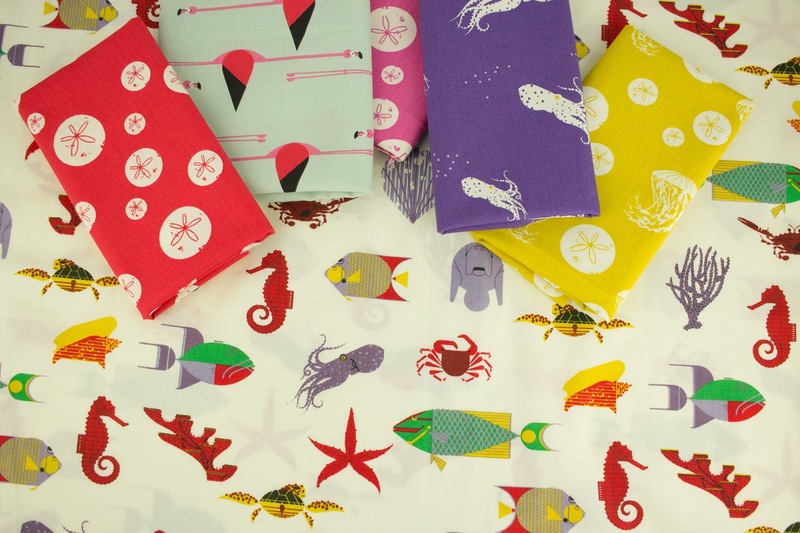 Love this fabric bundle! Great for non-pastel baby quilt or charity blanket! I would make Quilted headboards for my girls. They love purple and blue! The little red crabs are killing me!!! So cute!!! I love the idea of the quilt pattern with this fabric. I need to make a seaworthy quilt for a grandson who lives in Seattle and is due in July. I love the bundle. My grandson would LOVE anything out of this fabric. It really is adorable. What cute fabric and who does not like to win :-) Thank you. This fabric is adorable. I'd love to make a quilt for my nephew's five year old son. Very unusual, would love to make many cute things. A quilt for my granddaughter. Two yards of Charlie Harper fleece? I'd be spoilt for choice. But probably a sweatshirt. I would make a cute blankie and some pj bottoms! I would make something for my new granddaughter! Orange. PJ bottoms, or light weight zip hoodie for me. My wallet isn't happy that I saw this collection!! I love it all so much! That love on the richter scale print needs to be curtains in my home we plan to build in the Florida Keys. A quilt. ❤️ This fabric! I would love to make a little patchwork jumper for my granddaughter and patchwork shorts for my grandsons! Organic fleece sounds perfect for simple pull on pants for small grandkids. Colour.. something earthy or grey. A quilt for my youngest. I just made my first quilt, using all fabric from your Paso Robles shop! I am addicted!! I would love to use this fabric to try a second! I like to use fleece as a blanket back to make it snugly. My favorite color is blue. Fleecy rag doll bunnies for my daughters. Love the Organic Fleece in Shroom! Would definitely back a cozy throw quilt for my snuggling with my boys with the soft fleecey goodness! Thanks for sharing! Charlie Harper illustrations are my fave and the fabric prints chosen for Maritime are just gorgeous! I would make a fleece blanket for my 2 yr old grandson. Red is my favorite color. I make a quilt. Thanks for the giveaway!! I'm a quilt maker, but I would love to see these fabrics everyday, so maybe a throw pillow cover, too? Maybe even cover some canvas and make wall art? So many possibilities! I would make a fleece blanket and my color is blue. And, I love Charley Harper! I would make pj pants for my girls. I love the color Turquoise. I would make a blanket and some PJ pants for my kids! I love teal. I accidentally entered (2 entries?) If my name for some reason, gets drawn, please draw another. I really wanted to comment and ask: ends Sunday 3/2? It's really Wednesday that it ends, correct? Need some lounge pants. Maybe in blue. I've loved the Charley Harper line of Embroidery & Cross Stitch for a long time. I am so happy when you all started carrying his line of fabric. It gives people the chance to see a great mind at work. I think I would have to go with a teepee for my granddaughter. I think it would look wonderful in the sea animals. Thanks for the contest & Good Luck Everyone. I would make summer outfits for my best friend's baby son! I'd make a baby blanket! Love the new maritime line! Love the sand dollars!! What cute fabric! Out of fleece, a robe or something cozy. Out of Charley Harper, up, EVERYTHING in my life would be Charley Harpered! I love this Charley Harper line ! Our of fleece, I would make a new hoodie for my oldest - probably in navy. Thanks for the chance to win.